Ironman triathlons are extreme endurance challenges that test your physical limits. With a 2.4-mile swim, 112-mile bicycling race and full marathon, the race provides many opportunities to sweat valuable fluids. Fluid loss affects many organs, including your ears. Dehydration symptoms include ringing of the ears, loss of balance or coordination, dizziness, fatigue and cramping. A hydration plan is needed before undertaking Ironman training or competition. Contact your doctor if you experience dehydration symptoms. Dehydration occurs when you lose more fluids -- through sweat or elimination -- than you ingest. Your body -- composed of approximately 60 percent water -- requires fluids to function regularly. In an Ironman triathlon, you lose a significant amount of water weight. A 2004 study in the "British Journal of Sports Medicine" found participants lost up to 7 percent of their total body weight during competition. Lack of fluid affects the physiological systems and can lead to mild symptoms, including dry mouth and mucus membranes, headache and dizziness or severe symptoms like low blood pressure, rapid heartbeat, fever and delirium. The inner ear -- an organ filled with fluid -- is affected by dehydration. Fluid balance is maintained by a charged particle, or ion's, transport across the inner ear's membranes. This fluid helps maintain body equilibrium and transmits sound. The inner ear needs adequate blood flow to supply nutrients for fluid homeostasis, according to an April 2001 study published in "The International Tinnitus Journal." As dehydration sets in, blood volume decreases and mineral imbalances occur, affecting the inner ear's fluid. Fluid imbalances in the inner ear lead to several symptoms and conditions -- some more serious than others. Dizziness or vertigo, tinnitus, fullness in the ears or hearing loss can stem from inner-ear fluid imbalances, according to Loyola University. You may also experience a loud noise or "rushing" sound in your ears and loss of coordination or balance. 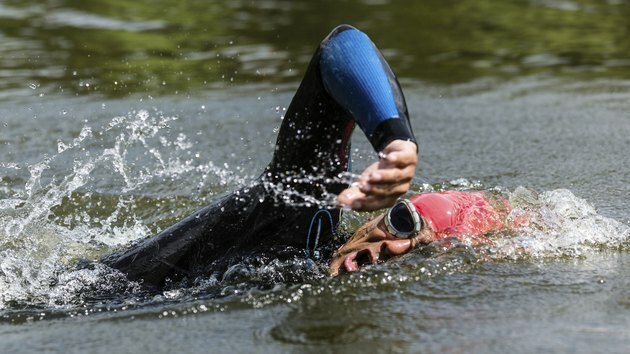 During an Ironman competition, these symptoms are dangerous. Falls from your bike or while running can cause injuries. If you fail to hydrate, serious -- and sometimes lethal -- health consequences can occur. Proper hydration starts before you begin exercising. The triathlon's organizers recommend drinking 8 to 16 ounces of fluid two hours before training and another 8 ounces about 15 minutes before starting. You need 4 to 10 ounces at least every 15 minutes while exercising. Weigh yourself before and after training sessions to determine how much fluid you should replace. Drink 20 to 24 ounces of fluid for every pound you lose during a workout. Water is fine for workouts under an hour; when exercising longer, however, try a drink containing 6 to 8 percent carbohydrates. You also need electrolytes like sodium and potassium to prevent overhydration or muscle cramping.